I’m still not over how abysmal Raw was this week. I’m not someone who basks in negativity, either. I simply call it how I see it. It was a really bad show. 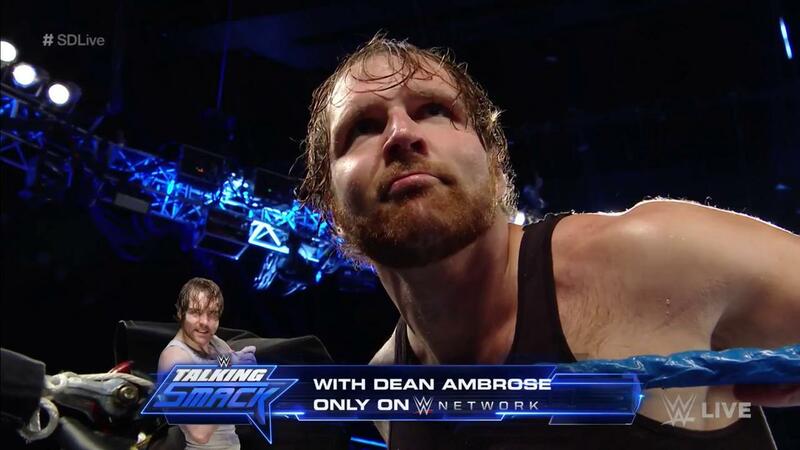 If you buy into the manufactured Raw vs. Smackdown stuff, Smackdown had it easy this week. What it often comes down to with Smackdown is the very simple philosophy of “Less is more.” That’s a refreshing approach. In 2016, WWE’s approach is almost always, “More is never enough.” We’ve got more than three hours of Raw each week, and pay per views that tend to go on even longer. Not to mention supplementary content on the network. WWE television used to leave you wanting more. You simply couldn’t wait to tune in next week to find out what happens next. Nowadays, the opposite is often true. We turn off shows feeling exhausted or frustrated. Wrestle mania XXXII went so long I actually considered turning in my fan card for awhile. In entertainment, there’s always something to be said for conciseness and restraint. Smackdown almost feels like a throwback to an era where there wasn’t a push for so much content, and each minute of WWE TV seemed to matter just a little more. Both these ladies are very natural in their roles. They had to recite lines that were obviously scripted. But Becky’s fire was great. Alexa has the snobby high school cheerleader act down pat, and she’s very expressive. I just wish they’d quit comparing her to Harley Quinn. Because here’s the thing: She’s not Harley Quinn. She’s Alexa Bliss, and she’s still coming into her own as a national TV character. The Harley Quinn thing almost sends mixed messages to the audience. The Usos def. American Alpha to earn a Smackdown Tag Title shot at No Mercy. Red and black is definitely a better fit for the Usos than red and white. They actually look tough. Both Jason Jordan and Chad Gable are absolute suplex machines. They’re both so explosive, which is part of what makes them so fun to watch. On the flip side, the Usos need another move in their arsenal besides the superkick. They do know that’s the move Shawn Michaels used to retire Ric Flair, right? And here they are practically beating it into the ground. During this segment, David Otunga mentioned something about filming a movie with Adam Sandler. That’s not exactly something to brag about in 2016, is it? Baron Corbin def. 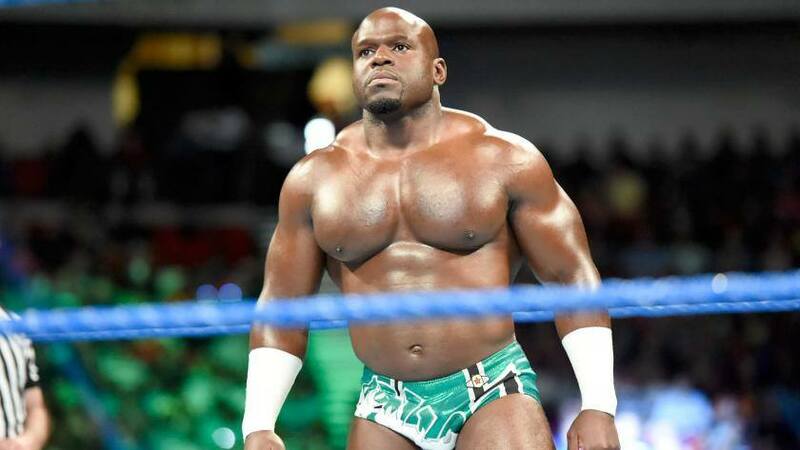 Apollo Crews. On the subject of Otunga’s commentary, he said here that this was the first time he’d seen Crews not smiling. That’s a good thing. As athletically gifted as he is, a white meat babyface label can drag your career into the gutter. That’s largely what’s happened to Crews lately. We also got Jack Swagger on headset during this match. Not sure what we did to deserve that. The Miz def. Dolph Ziggler to retain the Intercontinental Title. I don’t mean to keep harping on Otunga. But during this match he said “most people never win a title during their time here.” Um, yes they do, good sir. In fact, it’s a hell of a lot more likely now that we’ve got so many belts. In January 2016 we had five titles. Now we have nine. And that’s not counting NXT. It’s a nice idea, and I understand them wanting to make the IC belt seem as prestigious as possible. But statements like that hurt an announcer’s credibility, and Otunga had so little to begin with. I’ve enjoyed seeing Miz mimic Daniel Bryan’s old move set. It’s a creative little dig. These two may not be able to have a match, but I wouldn’t be surprised if Bryan gets Miz in the Yes Lock at some point. I’ve heard some buzz about a Miz vs. Ziggler steel cage match at No Mercy. Instead of doing that, why not just have Ziggler wrestle in goggles? It’d protect him from getting sprayed in the eyes over and over, and it would save us from having to watch Ziggler lose yet another match to Miz. Randy Orton def. Erick Rowan. Bray Wyatt cuts a promo, saying “a god can never die.” That promo was pure fluff. Bray said he and Orton are locked in “the unholiest of matrimonies.” What does that even mean? That line about never dying doesn’t mean anything either. When people talk about Bray’s promos being nonsensical, this is what they’re talking about. Orion’s got a rematch with Brock Lesnar this Saturday at a house show in Chicago. While we’re out getting Ziggler goggles, we might want to get Orton a helmet. Nikki Bella def. Natalya via disqualification. So Nikki gets the DQ win after Carmella interferes in a short match. I don’t mind this little program at all. It keeps Nikki away from the title picture for a little while, and allows Carmella to grow a little. It’s a win-win. 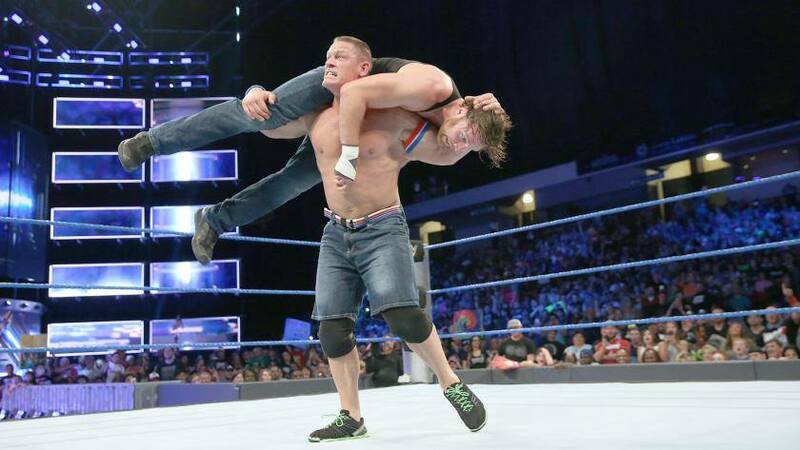 Very surprised to see Ambrose pin Cena clean. But from a story perspective, it lends credence to what Ambrose said last week about Cena not being able to cut it in the ring anymore. Things feel nice and personal between them. I’m hoping we see them in a big pay per view match down the road. So Cena accidentally costs Ambrose the title next week, and we take this to No Mercy. This entry was posted in Wrestling and tagged Adam Sandler, AJ Styles, Alexa Bliss, American Alpha, Apollo Crews, Baron Corbin, Becky Lynch, Bray Wyatt, Brock Lesnar, Brock Lesnar vs. Randy Orton, Carmella (WWE), Chad Gable, Daniel Bryan, David Otunga, Dean Ambrose, Dolph Ziggler, Harley Quinn, Jason Jordan, John Cena, less is more, Nikki Bella, pro wrestling, professional wrestling, Randy Orton, The Miz, The Usos, WWE, WWE Monday Night Raw, WWE No Mercy, WWE No Mercy 2016, WWE Raw, WWE Smackdown, WWE Smackdown Live, WWE Smackdown Results on 09/21/2016 by primaryignition.